I recently took a break from playing Hitman 2. I was playing it a lot, and if you’re a regular reader of my twice-weekly blog entries you already know how I feel about that game. But variety is the spice of life, so they say, and I needed to step away from the meticulous planning and puzzle solving of Hitman 2. So I stepped out of Agent 47’s signature suit (or whatever disguise he happened to be wearing) and stepped back into my spacesuit for a return to No Man’s Sky. Within moments, I remembered how much I’ve loved this game from the very beginning, and it’s only gotten better. A steady stream of free(!) content updates and visual improvements have made the vast universe of No Man’s Sky not only more fun to explore, but even nicer to look at. It’s so nice that I’ve taken up a new hobby in this impossibly big game: photography. This was taken from last night’s adventures. I found myself on a lifeless moon on the far edge of an uncharted solar system. It was eerily quiet, and the only sound was my footsteps upon the forgotten moon’s surface. I turned around and saw not only the system’s sun peering out from behind the nearby planet, but the system’s other planets in almost perfect alignment. I couldn’t capture the full scale of what I saw, but the game’s robust Photo Mode allowed me to capture an image that embodied the spirit of what I was feeling in that moment. I’m making heavy use of the Photo Mode now and I post many of my better photos to my personal Twitter feed. Finding interesting planets and seeking the right moment for a dramatic photo has become a game by itself for me. 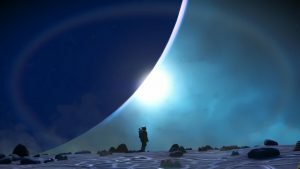 And now that I’ve finished No Man’s Sky head-spinning storyline, I’ve decided that’s what my Traveler has become: a starry wanderer seeking beauty and impossibility for the purpose of immortalizing it a frozen moment of time. I really like No Man’s Sky.